Given by Dr W.L. Hildburgh F.S.A. This carved capital comes from the cloister of a monastery. A cloister is a courtyard enclosed by low, arcaded walkways. Here, the capitals would have been easier to see than those on taller columns inside the church. People would have noticed them as they passed by during their daily routine or in religious processions. When the cloister was used for study and meditation there would have been time for a closer look. It seems that this type of foliage, originating around Toulouse, had spread to the North of France by at least 1150: evidence of this is the foliate ornament found on the so called "Odo tomb" in the Musée Saint-Remi, Reims, the tympanum in the Musée Lapidaire at Reims and a capital in the Victoria & Albert Museum - A.43-1950. 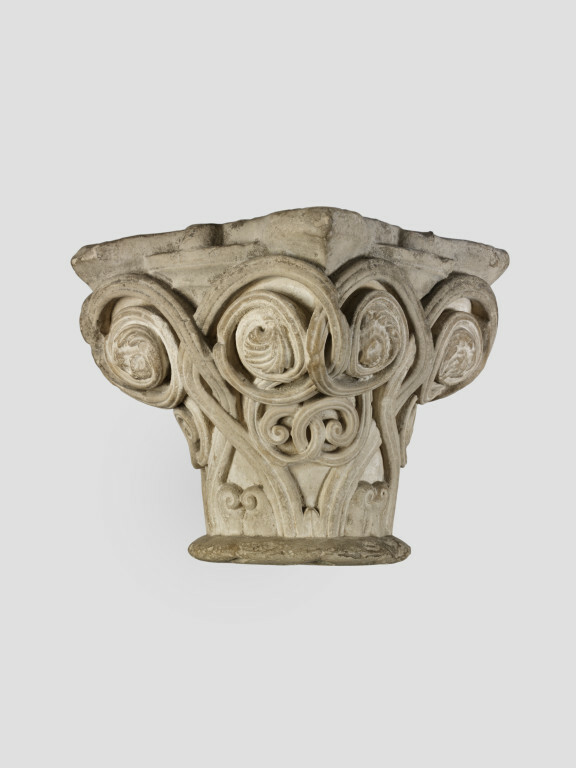 The fleshy foliage on this capital can be most closely matched on some capitals from Saint-Sernin, Toulouse, now in the Musée des Augustins (Mesplé Toulouse, cat . nos 217-219) these are to be dated in the second quarter of the twelfth century. It seems that this type of foliage, originating around Toulouse, had spread to the North of France by at least 1150: evidence of this is the foliate ornament found on the so called "Odo tomb" in the Musée Saint-Remi, Reims, the tympanum in the Musée Lapidaire at Reims and a capital in the Victoria & Albert Museum - A.43-1950. In addition, the lion on the mask on face b is very close to the the heads of harpies on two of the capitals found in 1952 embedded in the arcades of the south wall of the rebuilt chapter house of Saint-Remi in Reims (A. Prache, Saint-Remi de Reims, in Champagne Romane, zodiaque, 1981, p.167 pls. 75 and 78): all the faces share a similar profile of a slightly up-turned nose, fretwork teeth, and almond shaped eyes. The Reims capitals are most probably to be dated to around 1140-1150. The device of incorporating masks into the spirals, an extremely rare feature on capitals, may be seen on a capital in the Philadelphia Museum of Art also considered to be from Champagne. Limestone capital composed of thick, fleshy scrolls, terminating on each side in two spirals. Within these spirals are (on face A) a human head and a leaf, (on face B) a lion mask and a bearded head., (on face C) a leaf and a berry, (on face D) a flower and a bearded head. The condition is reasonably good. The fleshy foliage on this capital can be most closely matched on some capitals from Saint-Sernin, Toulouse, now in the Musée des augustins (Mesplé Toulouse, cat . nos 217-219) these are to be dated in the second quarter of the twelfth century . it seems that the this type of foliage, originating around Toulouse, had spread to the North of France by at least 1150: evidence of this is the foliate ornament found on the so called "Odo tomb" in the Musée Saint-Remi, reims, the tympanum in the Musée Lapidaire at Reims and a capital in the Victoria & Albert Museum - A.43-1950. In addition, the lion on the mask on face b is very close to the the heads of harpies on two of the capitals found in 1952 embedded in the arcades of the south wall of the rebuilt chapter house of Saint-Remi in Reims (A. Prache, Saint-Remi de Reims, in Champagne Romane, zodiaque, 1981, p.167 pls. 75 and 78): all the faces share a similar profile of a slightly up-turned nose, fretwork teeth, and almond shaped eyes. The Reims capitals are most probably to be dated to around 1140-1150. 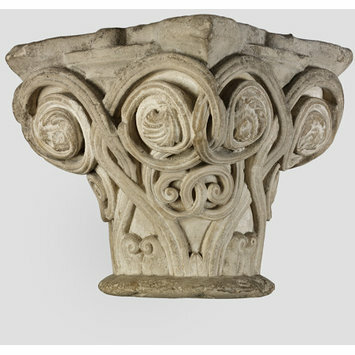 The device of incorporating masks into the spirals, an extremely rare feature on capitals, may be seen on a capital in the Philadelphia Museum of Art also considered to be from Champagne.